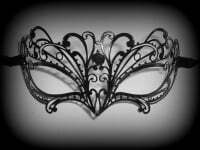 Designed from breathtaking inky gloss black metal, this very pretty & delicate filigree mask is decorated with a sensational authentic Swarovski crystal finish. Quite simply stunning! Perfectly blended to add a playful sense of style with sleek sophistication to your party wardrobe. Finish the look with a statement LBD & you're all set for exceeding the upcoming trends. 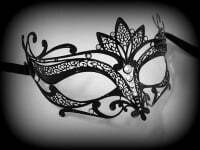 As always Simply Masquerade bring to you this extravagantly designed & handmade mask for women. 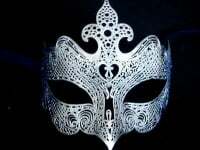 A must-have for all girls out there who love to show off their feminine style - This Blumen Strass Venetian Filigree Masquerade Mask is the missing touch to your look.